SAN DIEGO – April 21, 2016 – Rock ‘n’ Roll Marathon Series and Garmin today announced an extended partnership through 2018. The agreement spans all U.S. and Canadian Rock ‘n’ Roll Marathon Series events where Garmin will be the official GPS and fitness watch. 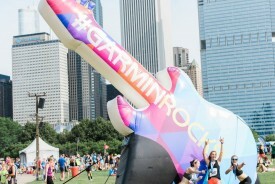 Garmin is Rock ‘n’ Roll Marathon Series’ longest standing partner, dating back to 2007. As part of the agreement, Garmin will continue to have a presence at the Health & Fitness Expo. The brand will also maintain their social media campaign and sweepstakes, #GarminRocks. Participants who post a photo on social media and use the #GarminRocks will be entered to win a grand prize free trip to Las Vegas to participate in Rock ‘n’ Roll Las Vegas Marathon & ½ Marathon and a Garmin Forerunner GPS. Additionally at each Rock ‘n’ Roll Marathon Series event throughout the season a winner will be selected from the social media contest participants to receive a Forerunner of their choosing. More than 600,000 professional and amateur athletes from all over the world will participate in a Rock ‘n’ Roll Marathon Series event in 2016, which has expanded to 30 markets worldwide. The series of marathons and half marathons are known for placing entertainment stages along the course, lining the route with cheerleaders and topping the experience off with a finish line concert celebration for all participants. The musically-themed races helped spearhead an active lifestyle movement that provides unique entertainment for runners of all abilities.